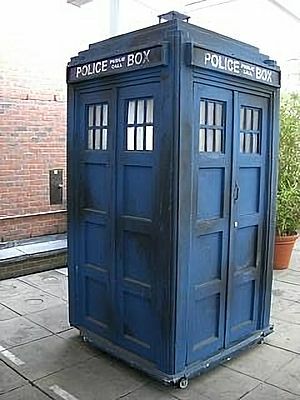 The current TARDIS prop used since 2010. Doctor Who is a BBC science fiction television series. The series is about an alien time-traveller known as "the Doctor". In his space-and-time-ship, the TARDIS (Time and Relative Dimension in Space), the Doctor and his companions travel through space and time. The story is about a man who calls himself "The Doctor". He travels in his space-time-ship TARDIS ("Time And Relative Dimension In Space"), with which he can go anywhere in time and space. 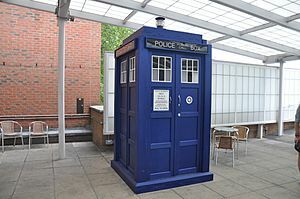 Because of an error in its chameleon circuit, the outside of the TARDIS always looks like a 1960s-style British police public call box (similar to a blue telephone box), but on the inside the TARDIS is much bigger. The Doctor is an alien, a Time Lord from the planet Gallifrey. At first, he travelled only with his granddaughter Susan Foreman. Later, the Doctor took other people with him. They are usually called "companions" or "assistants". The Doctor and his companions travel through space and time, have a lot of adventures, and often save many people. Instead, the series started again in 2005, with Christopher Eccleston as the Ninth Doctor. He was replaced by David Tennant at the end of the series. The actor who now plays the Doctor is Peter Capaldi, who joined the show in the 2013 Christmas episode. The Doctor is the central character of Doctor Who. He is an alien, a Time Lord from the planet Gallifrey. The Doctor often takes other people with him, who are usually called "companions" or "assistants" (or, due to a misunderstanding, "partners"). They are most often human. The most recent companion was Clara Oswald, played by Jenna Coleman. As a Gallifreyan, the Doctor looks human on the surface. However, there are differences. For example, he has two hearts. Also, if badly injured or dying, he can regenerate. During the regeneration, his body heals and renews itself. Then, he takes on a different appearance and personality. He is the same person (sort of) with the same memories and knowledge. But, he looks different and has a new personality. Because of this, the Doctor can be played by different actors. And in nearly fifty years, this is why the character has not actually "changed". The Doctor has been played by 11 actors in other media: theatre plays, parodies, etc. These are not officially part of the Doctor Who story. The movies Dr.Who & the Daleks and Daleks' Invasion Earth 2150 A.D. star Peter Cushing as a human scientist named Doctor Who. Shortly after it was announced that the series would return from its nineties hiatus, Richard E. Grant voiced The Doctor in an animated serial. The BBC issued press releases identifying Grant as the "ninth Doctor" but this was later disregarded by the revived BBC television series. The Tenth, Eleventh, and War Doctors met each other in the 50th anniversary special in November 2013. That was the first time the War Doctor was seen. That special had short appearances by all the other Doctors with the use of old, recycled footage. It also had a mysterious version of the Doctor from the far off future played by Tom Baker. The Eighth Doctor also made a return in 2013 for a 50th anniversary special mini-episode. The TARDIS is the Doctor's time machine. It can travel to any point in time and space, but the Doctor can never fully control it. The Doctor explains that TARDISes are not built, but they are grown like plants. The TARDIS is alive and has a mind of its own. In the episode The Doctor's Wife when the Doctor is able to communicate directly with its mind, the TARDIS explains that it did not always take him where he wanted to go,wanted to go but that "I always took you where you needed to go." On the inside, the TARDIS looks like a giant spaceship, but on the outside it looks like a police telephone box. These telephone boxes were still a common sight in many British cities when the series first began in 1963, but after the walkie-talkie was invented they were no longer needed. They were used by the police as workstations - and people could also use them to call the police. TARDIS stands for "Time And Relative Dimension/s In Space". The Doctor usually takes other people with him, who are usually called "companions" or "assistants". The Doctor and his companions travel through space and time, have a lot of adventures, and often save many people. The character of the companion was there so that the people watching the series could identify and feel close to a character. The companions were often present-time humans, so people could feel close to them, and they knew as much as the viewers. Because of this, the Doctor could explain things to his companions, and at the same time to the viewers. Almost all the Doctor's companions have been human, or human-looking aliens. Two companions were robots. The Daleks are one of the most powerful races in the Doctor Who history. They are the Doctor's worst enemies. They cry "EX-TER-MIN-ATE!" when they are about to kill someone. They look like small tanks or very large pepper pots. They first appeared in the first season episode "The Daleks". A more recent episode was "Into the Dalek" (2014). They are not robots, but horrible aliens kept in a metal casing. They were mutated from Kaleds by their creator Davros during a war on their planet, Skaro. They can not be easily hurt by guns because their casing reflects or destroys the bullets. Cybermen are another enemy of the Doctor. They are one of his worst enemies. In the original series, they come from the planet Mondas. In the new series, they come from a parallel universe. Cybermen travel across the universe taking people and turning them into machines. They stomp around saying "DELETE!". They kill by electrocution. They are vulnerable to the metal gold, and can be killed by gold bullets. They change their look over time, but stay recognizable by "handlebars" on their heads. The Doctor has faced them many times. The first was in "The Tenth Planet" (William Hartnell's final episode). A more recent episode was "Death in Heaven" (a Peter Capaldi episode). The Sontarans are a group of aliens that believe in war over anything else. They must face their enemy in combat because of their weak spot on the back of their neck. They have been said to look like baked potatoes. As of 2015, the Doctor has been played by thirteen actors. They are William Hartnell, Patrick Troughton, John Pertwee, Tom Baker, Peter Davison, Colin Baker, Sylvester McCoy, Paul McGann, John Hurt, Christopher Eccleston, David Tennant, Matt Smith and Peter Capaldi. A criminal incarnation of the Doctor was somehow spawned between his 12th and final lives. It tried to sacrifice the sixth Doctor so that he could obtain more "regenerations," allowing himself to live even longer. Doctor Who Facts for Kids. Kiddle Encyclopedia.